Mobile ecommerce sales rose 31 percent in the first quarter of 2013 as tablet-fueled, couch commerce is rapidly becoming the most popular form of online shopping with the so-called multi-channel shopper. Data from the IBM Online Retail Index and the U.S. Department of Commerce suggested that in-store retail sales grew 3.7 percent in the first quarter, overall ecommerce sales grew 20 percent in the first quarter, and mobile ecommerce grew the aforementioned 31 percent for the quarter. This data indicates that the growth of mobile ecommerce outpaced brick-and-mortar sales growth by nearly 10-to-1 and accounted for roughly 17.4 percent of all ecommerce sales, again according to IBM. 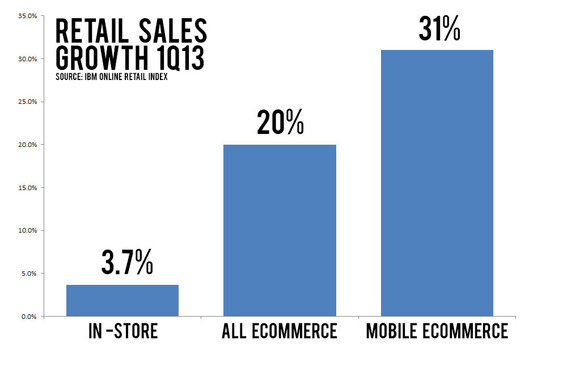 The growth of mobile ecommerce outpaced overall ecommerce sales growth. Total U.S. retail sales — excluding automobiles, auto parts, gasoline, travel, and food — were approximately $542.9 billion in the first quarter of 2013, according to the U.S. Commerce Department’s Advance Monthly Sales report showing preliminary data. Although official Commerce Department ecommerce data for the first quarter will not be available until May 31, the agency reported that ecommerce and mail order sales combined for about $117.75 billion. Some estimates place ecommerce sales — excluding catalogs and mail order — for the first three months of this year between $32.5 billion and, perhaps, $50 billion. If IBM’s data — mentioned above — is correct about mobile commerce’s share of online sales, tablet- and smartphone-based purchases may have reached between $5.7 billion and $8.75 billion in the first quarter. The growth in mobile ecommerce “reflects marketers’ ability to create a positive customer experience for consumers shopping on their iPads and Kindles, by designing for the finger and making it easier for customers to browse via their mobile devices,” IBM said in its index, apparently crediting mobile-friendly site and application design with at least some of mobile ecommerce’s success in the first quarter. If the IBM supposition is correct and site design in a key factor in mobile ecommerce growth, online retailers would be wise to focus on responsive design and, perhaps, application creation. Tablet usage also contributed to mobile online sales, IBM said, pointing out that iPad traffic increased nearly 80 percent in 1Q13 compared to the prior quarter. Tablets seem to represent the sweet spot, if you will, for online shopping. The devices are mobile enough to be handled while watching television, riding on a commuter train, or waiting in a dentist’s office, but are large enough to provide a much better usage experience compared to smartphones. There is a significant amount of data supporting this concept — that tablets are the preferred device for mobile ecommerce. As an example, Google’s The Mobile Playbook, 2012 reported that 72 percent of tablet owners used the device to make online purchases on a weekly basis. A separate Google report found that 45 percent of tablet owners made an online purchase during the 2012 holiday shopping season. Similarly, 56 percent of tablet owners used to the device to compare prices before making a purchase and 48 percent used a tablet to find product reviews. The data related to mobile ecommerce sales growth, may also point to more multi-channel sales. “The shopping experience has evolved. No longer can we look at shopping in silos, or in terms of in-store versus online. Instead, we have to consider the convergence of these channels, as the digital consumer demands a truly digital experience,” wrote Jill Puleri, IBM Global Retail Leader in a post related to an earlier update to the IBM Online Retail Index.